"Best show I have ever seen. This group of people are so talented and creative. This show had me laughing out loud in the best of ways! True genius and very worth the watch! Highly recommend for all to experience!" Library of Congress, Prints and Photographs Division. On November 11th, 2009, Amber Does Dallas brought REPO! The Genetic Opera and the REPO ARMY! cult phenomenon to the Dallas/Fort Worth area. With a troupe of experienced shadowcast performers and beautiful theatrical backdrops, Amber Does Dallas brought the movie to life at the historic Lakewood Theater. The show proved to be a smash hit, expanding from regular monthly performances to bi-monthly performances in March of 2010. On September 24, 2010, Amber Does Dallas expanded their repertoire, premiering their version of The Rocky Horror Picture Show. This marked the first time in six years that a shadowcast presented regular performances of Rocky Horror in Dallas. Just over a month later on October 29, 2010, Amber Does Dallas held their first Science Fiction Double Feature of both The Rocky Horror Picture Show and REPO! The Genetic Opera to a packed house. 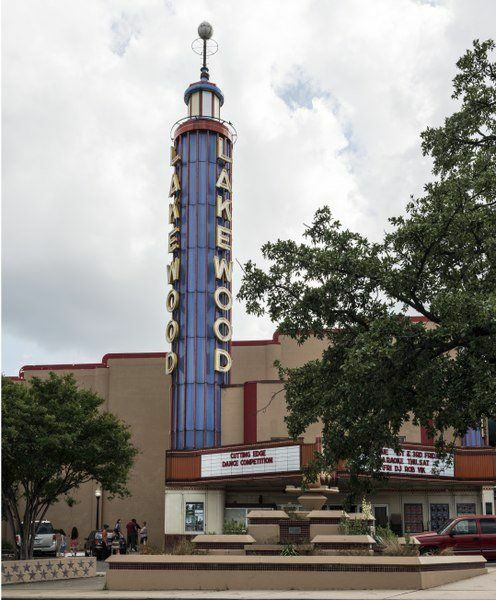 Tragedy struck the cast in 2014 when the beloved Lakewood Theater officially closed down. The cast now performs at the fantastic Downtown Dallas Angelika Film Center at Mockingbird Station, a powerhouse of cinematic art, on a regular schedule. They have also performed in other venues around Dallas, including The Church – Dallas’ most eclectic nightclub – as well as the alternative club Panoptikon. They’ve performed musical numbers at events such as the Dallas Zombie Walk and popular venues like the House of Blues, and they’ve performed at colleges such as the University of Texas at Dallas. Amber Does Dallas has become a staple on the convention circuit, performing at Fan Expo, A-Kon, All-Con and Texas Frightmare Weekend among many other DFW-based conventions. The cast was represented on the national all-star casts for both Rocky Horror and REPO! at the 2013 RKO Con, and performed as part of the entertainment for the 2013 National Convention of MENSA. Amber Does Dallas has been fortunate to perform for the creators behind the shows that inspire them! On August 26, 2011, REPO! co-creator Terrance Zdunich hosted a Q&A/autograph signing before their show. On May 4, 2013, they were privileged to have Patricia Quinn host the pre-show before The Rocky Horror Picture Show performance at Texas Frightmare Weekend 2013. One year later, at Texas Frightmare Weekend 2014, Nivek Ogre did a quick Q&A at their production of REPO! The Genetic Opera. The cast performed at Fan Expo 2017 to celebrate the convention's special guests Tim Curry, Patricia Quinn, Barry Bostwick, Little Nell Campbell, and Meat Loaf. Wherever they are, Amber Does Dallas promises to chill you, thrill you and fulfill you! Hey, I remember you guys, you used to be at the Lakewood Theater! Where are you guys performing now? That’s us! Now we have a show at the Angelika Film Center every month, in Dallas’ Mockingbird Station! It’s a fantastic venue, and we still have an adjacent bar! Plus, it’s immediately accessible through the DART rail, which is great news both for people who don’t have cars and alcoholics! There’s some jerk shouting stuff at the screen. Why isn’t anyone trying to stop this buffoon? Probably because that buffoon is a floorwalker. A floorwalker is someone who shouts out various funny lines during a shadowcasting show. We have several cast members who act as floorwalkers, but audience members are also allowed to riff on the movie as well. What is in the prop packs and when do I throw things? Water Pistol – Used to create “rain” after Brad and Janet’s car stops and the two are running to the castle as a storm starts. You will need to fill it yourself from the sink in the bathrooms. Newspaper – Worn over the head as Janet uses a newspaper to keep herself from getting wet. Party Hat – Usually put on just before The Time Warp, when the Transylvanian Party Guests first appear. Can be worn at any time, though. Surgical Glove – Snapped when Frank snaps his rubber gloves as he is explaining how he made Rocky. Noise Maker – Used during Frank’s presentation as he explains how he made Rocky. Playing Cards – Thrown during Frank’s song “I’m Going Home”, when he says “Cards For Sorrow, Cards For Pain”. Can I bring my own props from home? Is there anything I need to bring to the show? Money! Our cast sells a variety of neat items before our shows, and the proceeds help keep the show looking shiny and pro-tier!